Rhos Male Voice Choir dedicated part of their annual concert last weekend to the tragic events unfolding in Paris. The choir sang an arrangement of John Rutter’s “God be in my head and in my understanding” – based on a traditional Gaelic blessing - for those who had been killed or injured. 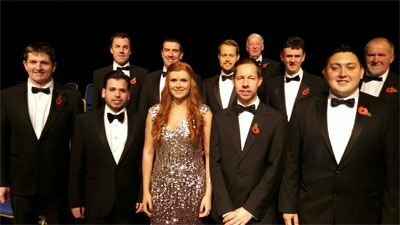 featured Rhos Boys Choir, and soloists Luis Gomes and Meinir Wyn Roberts. Part of the programme included arrangements by two former choir stalwarts – John Tudor Davies and Emyr James, and Mr Ethelston said these pieces in particular had been enjoyed by their family and friends. Among the other guests was Clwyd South MP Susan Elan Jones who said said it was a wonderful musical evening. After the concert several long-standing members of the choir were honoured for what chairman Alun Roberts said was a lifetime of service to the choir. 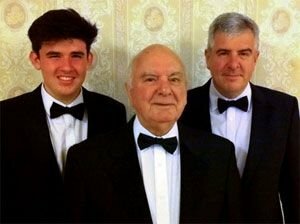 Gordon Williams – 69 years a member of Rhos Male Voice Choir – with son Kevin and grandson Gruffydd. recruits to the choir – his son Kevin and grandson Gruffydd. Also honoured were Harold Richards, Colin Aubrey, Glyn Jones and Dennis Mills, who have all been members of the choir for more than 50 years. Copies of the choir’s Christmas CD “Noe! Noe!” were also on sale at the concert. CDs can be bought from members of the choir, from Siop Y Siswrn in Wrexham and it is also available to download from i-tunes.